Starting a new online business but don’t have a website? This book will gently guide you through the process of creating an online business: how to go from nothing to www.MyBusiness.com in a month. The book doesn’t assume you’re computer fluent. If you can follow the simple step-by-step examples, you can create your own professional-looking website. I wrote this book after consulting with many small businesses and teaching them how easy it really is to launch your online business without spending a lot of money. Spending money is easy. Spending it effectively is harder. 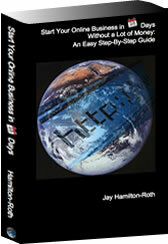 This book helps you understand the trade-offs. I’m so confident that the information in my book will save you time, money, and produce great results that I’m offering a money-back guarantee. Try the book. Contact me if you have any questions. If it isn’t everything I say it is, I’ll give you your money back. Starting a online business is not hard. Let me show you how. Why an online business? You can dramatically increase your revenue selling your products globally. I’m not a computer whiz! Designing a website isn’t much harder than creating a document in your word processor. There are clear step-by-step guides for doing everything. In 28 days? Actually, 28 days is being generous! How much is not a lot of money? Under $50/year can get you a very nice website. $9/year can get you a minimal website with your own domain name. I also show how to do it 100% free (if necessary). Already created your website? Want to measure your web traffic? Want to add a shopping cart? Better graphics? Website backups? Need some online business pointers? Just starting your first business? After working through this book, you’ll have both online (website, email, website analytics, and a shopping cart) and supporting printed marketing materials (business cards and flyers). You’ll also quickly understand how to market yourself effectively. I’ll provide a full refund.